No one else will be charged in connection with the deadliest mass shooting in modern U.S. history. In the year before Las Vegas gunman Stephen Paddock carried out the worst mass shooting in modern U.S. history, the high-stakes gambler appeared to have become increasingly unstable, distant and constantly complained of being sick, according to a final investigative report released Friday. Financial records also showed Paddock had lost more than $1.5 million in the two years before the Oct. 1 shooting that left 58 people dead and more than 800 others injured. One of Paddock's brothers told investigators that he believed the gunman had a "mental illness and was paranoid and delusional," and his doctor believed he may have been bipolar. Despite the revelations, police say they are closing their investigation without a definitive answer for why Paddock amassed an arsenal of weapons and unleashed gunfire from a hotel suite onto a concert crowd below. "What we have been able to answer are the questions of who, what, when, where and how," Clark County Sheriff Joe Lombardo said. "What we have not been able to definitively answer is ... why Stephen Paddock committed this act." Paddock was the only gunman, and he didn't leave a manifesto "or even a note" to answer questions about his motive, the sheriff said. With the final report released, the Las Vegas Metropolitan Police Department has closed its 10-month investigation and no one else will be charged, said Lombardo, the elected head of the agency. Earlier this year, U.S. prosecutors charged a man accused of selling illegal armor-piercing bullets found in Paddock's room at the Mandalay Bay hotel-casino on the Las Vegas Strip. Douglas Haig has pleaded not guilty and maintains he sold tracer ammunition, which illuminate a bullet's path. Interviews with Paddock's doctor indicated he had a "troubled mind" but displayed no behavior leading up to the shooting that would have prompted someone to alert police, the sheriff said. One of the gunman's brothers, Bruce Paddock, told investigators he had not spoken with his sibling for more than 10 years but believed he had "mental illness and was paranoid and delusional," according to the report. He also said he didn't believe his brother was a violent person or abused drugs or alcohol. Bruce Paddock speculated his brother "would've had to be 'very pissed off'" to carry out a violent attack, the report says. Stephen Paddock's girlfriend said he repeatedly complained that he was sick and doctors could not cure him. Marilou Danley told investigators that doctors told Paddock he had a "chemical imbalance." The report also included a summary of 14 of Paddock's bank accounts, which contained a total of $2.1 million in September 2015. Two years later, the amount had dropped to $530,000. He "wasn't as successful in the gambling as he was in the previous years," Lombardo said. Investigators said Paddock paid more than $600,000 to casinos and over $170,000 to credit card companies. The analysis said Paddock also made nearly $95,000 in firearms-related purchases. The report gave no other information about the casino purchases. High-rollers, like Paddock, are often given credit lines at casinos. The final details of the investigation came after police released 13 batches of investigative documents, 911 calls, police reports, witness statements and video over the last three months. They have illustrated chaos, heartbreak and heroism from first responders, concertgoers and others. 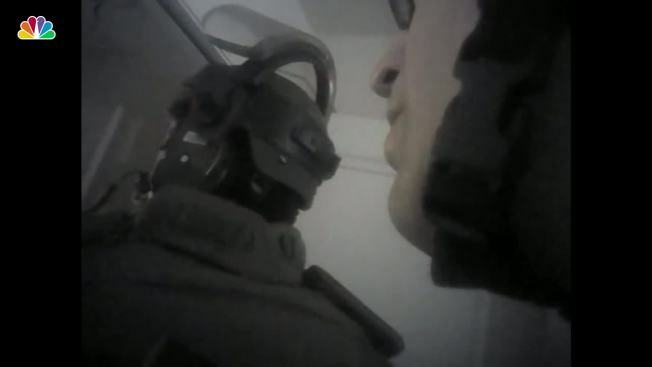 Police body camera video made public earlier have shown officers using explosives to blast through the door of a 32nd-floor hotel suite to find Paddock dead on the floor from a self-inflicted gunshot. Assault-style weapons fitted with rapid-fire "bump stock" devices were strewn about the room. The FBI's Behavioral Analysis Unit is expected to release a psychological profile of the gunman later this year, Lombardo said, noting that authorities want to leave "no stone unturned." He said the department is still conducting internal reviews into individual officers' actions on Oct. 1, including one veteran officer who froze in a hallway a floor below where Paddock was firing onto the crowd, according to a police report and body camera footage. Officer Cordell Hendrex acknowledged in a written police report that he was "terrified with fear" and said, "I froze right there in the middle of the hall for how long I can't say," he wrote. Video shows Hendrex, a rookie officer and three hotel security officers waiting in the hallway for about five minutes before moving to a stairwell toward the 32nd floor, where they remained for at least 15 minutes. Officials have said the attack had no link to terrorism, but hotel owner MGM Resorts International has invoked a federal law enacted after the Sept. 11 terror attacks. Associated Press writers Regina Garcia Cano and Michael Balsamo contributed to this report.